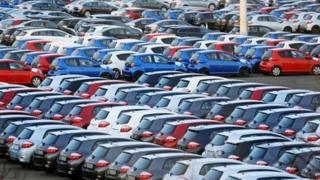 EU car sales rose last month, lifted by demand in former crisis nations such as Greece and Ireland. The Association of European Carmakers (ACEA) said sales jumped 5.5%, to 935,640 vehicles, from January 2013. It was the fifth consecutive month of growth, which have been supported by big discounting by manufacturers. Sales in Greece rose 15.4%, Portugal jumped 31.8%, and Ireland was 32.8% better, supporting other data pointing to economic recovery in the countries. All the major EU markets posted growth, with the UK and Spain up 7.6%, Germany up 7.2%, Italy up 3.2%, and France edging ahead 0.5%. Cars sold under the Volkswagen, Peugeot and Renault brands did particularly well, according to the ACEA data. Germany's Volkswagen, Europe's biggest manufacturer by volume and the owner of Seat, Bentley and Lamborghini, posted an 8.2% rise in sales, helped by a 10.3% rise in registrations at its Skoda brand and an 8.5% gain at Audi. "Today's figures show that we're on the road to recovery," said Allan Rushforth, chief operating officer at Hyundai Motor Europe. "The question is how much of that recovery is organic and how much is the result of actions taken by governments and carmakers," he said, in a reference to subsidy schemes and big discounting. Hyundai, which saw European sales fall 5.5% in January, said it would not pursue market share gains at all costs.